When she was a lieutenant junior grade, Detmer served aboard the USS Shenzhou under Captain Philippa Georgiou as the starship's helmsman in 2256. She was wounded in the Battle of the Binary Stars. 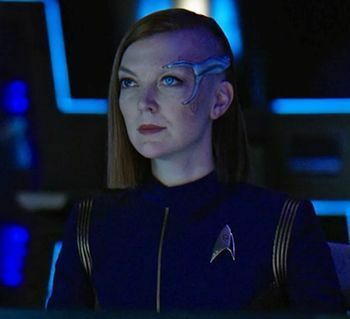 Six months after the destruction of the Shenzhou, Detmer was promoted to full lieutenant and was assigned to serve as helm officer under Captain Gabriel Lorca on the USS Discovery, by which point she appeared to have cranial and ocular implants. Upon seeing mutineer Michael Burnham for the first time on the Discovery, she chose not to speak to her. Detmer was responsible for initiating the Discovery's spore drive, and was at the helm when the ship made attempts to reach Corvan II, both an initial abortive attempt, which saw her maneuver the ship out of the gravity well of an O-type star, and a second attempt, during which Detmer brought Discovery to a halt over the mining colony. In late 2256, Detmer was dating a Human male Discovery crewmember.